James POWELL was born in Yarpole, Herefordshire to William POWELL & Elizabeth LANWARNE. In December 1863 he married Jane WATTS in Little Hereford, Herefordshire. Jane already had one child, an infant son, George WATTS born earlier in 1863. It is most likely that George WATTS was also the son of James Powell. After marrying the couple moved to Broomfield, Shropshire where four more children where born; Louisa 1865, William 1867, Mary Ann in 1869 and Elizabeth POWELL in 1871. All four of these children were christened in Broomfield, Shropshire. 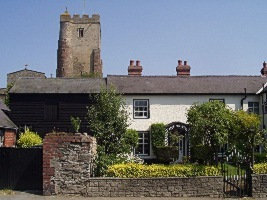 By the birth of their last child, James POWELL Jnr born 1873, the family had moved to Leintwardine, Herefordshire. It was after the move to Leintwardine that James POWELL Snr died in 1873, aged just 39. His daughter Elizabeth POWELL was barely 2 years old at the time of her father's death and there can be no doubt this event would have had a profound effect on her life and that of her family, especially their financial situation. In the 1851 UK Census 11 year old Jane WATTS is living with her family in the town of Orleton, Herefordshire. 15 year old James POWELL is living with his mother, Elizabeth, four brothers and a sister in nearby Yarpole, Herefordshire. By 1861 Jane WATTS is 21 and and working as a dairy maid in the Village of Hopton Castle, Clun, Herefordshire. James POWELL is a 26 year old agricultural labourer boarding with a Thomas POWELL and Thomas' mother, Susan in Thornberry, Herefordshire. 1871 Census shows the POWELL/WATTS family is split with James and four of his children in Bromfield, Shropshire, while Jane and infant daughter Elizabeth are are visiting Jane's mother and unmarried brother in Orleton, Herefordshire. The census was taken in April of 1871, and Jane's mother, Mary WATTS nee DAVIES died in the June Quarter of that same year. The 1881 census shows Jane POWELL nee WATTS as 41 and a widow with six children to raise. The family is now living in the town of Leintwardine, Herefordshire and Jane is working as a farm servant. Jane POWELL nee WATTS and her family are still living in Leintwardine at the time of the 1891 census, although by this time her daughter, Elizabeth POWELL has an infant son, William Mason Powell, just 4 months old. It is possible that young William's second name of Mason is a clue to the identity of his father. In 1901 Jane POWELL is aged in her 60s and, with the help of her daughter Louisa POWELL and son George WATTS, has the care of five grandchildren. Three are Elizabeth's children. The other two are the sons of George WATTS, now widowed. As neither Jane nor her daughter Louisa appear to be employed at this time, it seems likely that the family was receiving financial help not only from George WATTS but also from Elizabeth TURNER nee POWELL, now herself a widow and working as a domestic servant for clergyman John Wood and his two spinster daughters in Pemberton, Lancashire. Although we know from her birth certificate and christening details that Elizabeth TURNER nee POWELL was born in Bromfield, Shropshire, in the 1901 census she has given her place of birth as Leintwardine, Herefordshire. As she had lived virtually all of her life in that town, she may well have been unaware she had not actually been born there. The life of female domestic servants at the turn of the 20th century was particularly hard. Many had to hide the fact of husbands and/or children in order to keep their jobs. This was especially so if those children were unfortunate enough to be born out of wedlock. Children of domestics servants were often raised by relatives while their parents toiled for meagre wages in the homes of the better off. If they did not have family willing to look after them, these poor children, especially those who were illigimate, might be placed in 'Baby Farms' where they could well be starved and mistreated, sometimes to the point of death. Domestic servants of both sexes were three times more likely than the general population to end up in the 'Workhouse' or to bear children out of wedlock. Their lives were full of drudgery and uncertainty, with little or no prospect of advancement. Young, female domestics servants could also find themselves vunerable to the unwanted advances of unscrupulous masters as well as those of other, male domestics in the households where they worked.